It’s Friday and time for Susanne’s meme for sharing some of your favorite things from the week. I’m glad it’s Friday because I’m looking forward to the weekend! 1. We had a surprise snow this week! Not much for lots of you in the north but snow, most any snow, is a big deal in the south because we just don’t get it but maybe once a year. This is what we woke up to on Sunday morning, kinda fun. 2. The opposite of that is the spring like weather we’re now having, I love it! It was around freezing at the first of the week but is now in the 70’s this weekend. 4. Facebook games, especially Scramble with Annie! 5. Bread machine I got for christmas….I’ve had fun playing with it. 6. Lost! Some good, good tv! I may be lost half the time but oh what fun to figure it out. Number 5 comment was made by Sandra……..I’ll get the Heather Creek books out to you in a few days! And Sweet September are the first two books in a new series by Guideposts called Home to Heather Creek. In Before the Dawn we meet Charlotte Stevenson; her daughter Denise ran away from home at eighteen and is the mom to three children. After she dies in an automobile accident, Charlotte brings the teen age children home to their farm in Nebraska. The kids are virtually strangers to Charlotte and her husband Bob and are not thrilled to leave behind their life in California for a very different life on the farm. Sweet September picks up the story as harvest is beginning. The kids and grandparents are becoming a bit more comfortable with each other but are still learning to deal with their grief and how to become a family while trusting in God to help them through. Lauren was sweet enough to pass these along to me a few months ago to read and my sister Stacy read them when I was through. I’d like to pass along both of these books so if you’re interested in them let me know in the comments. I’ll leave this up and open all week. In three years of sometimes sporadic blogging I’ve never really had anyone visit my blog by doing some random or odd google search. There’s been just a handful of people that have found me by googling “gail”……nothing unusual there since that would be my name. But a couple of weeks ago I noticed that there had been some different searches that led people here; and may I just say that whatever it is you’re looking for, you still probably won’t find it here! 1. toothbrush song by gail….I SO wish I had written a song but maybe not about toothbrushes! 4. sewing cowboy dress up….Git along little dogies! 6. superman sunday school lessons…….THAT should be a fun class! 7. what high school did erynn mangum go to…..well I believe I can guarantee it wasn’t in Mississippi! 9. a song to memorize the bones in the body…..Oh my goodness, I would like to hear that song! Nope, I still don’t think you’ve found what you’re looking for here at my place; but it was good for a few laughs for me! It’s been a while since I participated in this monthly meme……my laptop crashed before Christmas, my blog was down for a while and then our internet service was out! I hope that will be it for the computer problems until much later. Not pictured but something I just finished were the Sunrise series of books by Karen Kingsbury; the last of the books about the Baxter family. I enjoyed them all and was sad to see them come to an end! At times they might be predictable but I’m ok with that and like to read something clean. 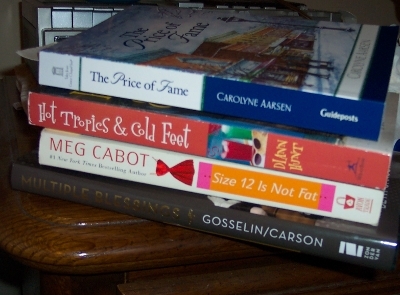 Multiple Blessings by Kate Gosselin is on the bottom and I actually just finished it as well. You might know it from the tv show about their life with 2 sets of multiples and if you like the show you’ll probably enjoy the book. I thought it gave some interesting info about their early days and struggles. Size 12 is Not Fat……I know nothing about this one and haven’t even read the blurb on the back! It’s one of the many fiction books loaned to me by my sister Stacy. Hot Tropics and Cold Feet…..I’ve not read anything by Diann Hunt yet; this is another borrowed book. The Price of Fame….a Guideposts book from the Tales of Grace Chapel Inn series and the one I’m currently reading. Surprise, it came from Stacy…..she’s better than the library! Not sure what will be up next for me after I finish these but the sack of books she sent with me is big enough to have plenty of choices. I always love recommendations so tell me what you’ve been reading lately! This week has flown by for me! Time to share some favorite things from the week; you can find out all the scoop and join in the fun over at Susanne’s place. 2. Mashed potatoes……..it’s a crime how much I like them sometimes! 5. Surprise visit from my girls! I’m looking forward to the weekend and hoping to catch up on some sleep. Hope your weekend is great too! A few days ago I took my car to a dealership in a neighboring town to have a recall thing fixed on it….the heated windshield washer part needed replacing. Here in the deep south it’s very important to have a heated windshield washer! But I’m ready now should we need it; I also got a new inspection sticker. It was time for one but we won’t talk about whether it was past time or not. As I’ve been known to do in the past, I went to walmart afterwards. That’s only because I don’t live anywhere close to a target. 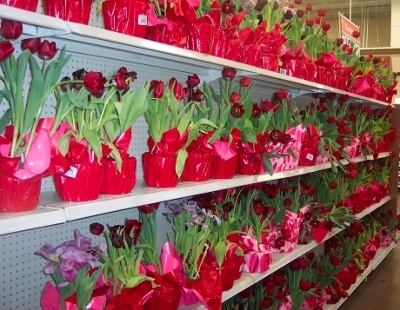 While wandering down the aisles I came across a long row of tulips in pots that I suppose had been there for valentines day. They were marked down to just a couple of dollars and I briefly thought about buying one for myself. But they were just sad looking for the most part; most had flopped over, looked wilted and had lost color. It looked lonely to see long rows of them! I’m not sure my picture shows how bad I thought they looked when I first spotted them. Later that same afternoon my girls drove up to surprise me. It was my birthday so they came to see me and eat with us. They literally scared me to death because I thought I was alone in my room and I came out of the closet and saw something move out of the corner of my eye! It was fun to see them for a few hours and visit with them. Look at one of the things they brought me! 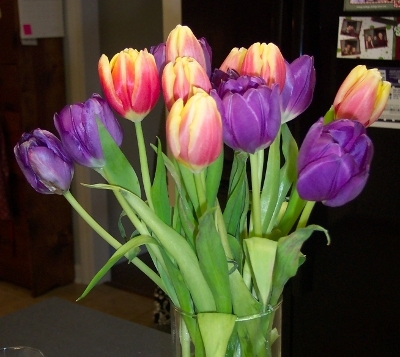 I love tulips and the colors of these are so pretty! I love these way more than the sad looking ones! 1. Read…..I have to read every day, usually whatever book I’ve got going but I would feel all twitchy and out of sorts if I didn’t get to read. 2. Cook, it seems like I’ll have to do that forever. 5. Put contacts in………I can’t sleep in mine so I have to put them in and out every day. 6. Use prescription eye drops…..will have to do this forever to preserve my eyesight! 8. Usually listen to music of some sort; and/or try to get songs out of my head that just get stuck there! Is there always a song or songs running through your head or am I the only one that happens to? So, what do you do every day? Let me know if you post this so I can come read yours! edited to add: I forgot to say that I first saw this at Karen’s blog in this post. If you decide to play along, let me know and I’m sure she’d like to see it as well! 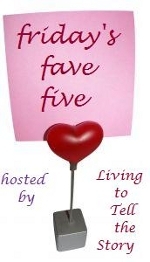 Since I’ve got my laptop back from repairs and mostly running, I thought I’d join in this week over at Susanne’s Friday favorites. It’s been a while since I’ve done this one, let’s see if I remember how it’s done! 1. My favorite thing that’s happened recently….finding ALL my pictures on my external drive that I thought I’d lost when my laptop crashed! Yay! 2. Having hubby home again after a business trip. 3. Books; specifically this week the Sunrise series by Karen Kingsbury. It’s the last of her books about the Baxter family and I think I’ll be sad to finish the last one. 4. A cup of spice tea at night while reading. 5. Some of my reality shows starting back up this week! I’m a junkie and might need help. 🙂 But it will be fun to see Amazing Race again, along with a few others. What’s been your favorite things this week? I hope y’all have a fun weekend and good Valentine’s day! We haven’t seen our kids in Texas since Thanksgiving. I’m missing them terribly so I was excited last week when my daughter in law shared some pictures on facebook. 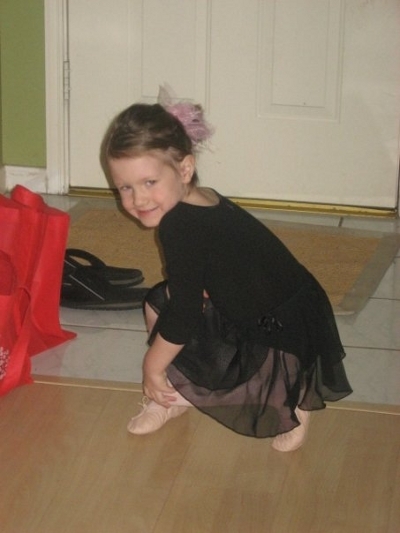 She had signed Ava Clair up for dance classes and oh what fun I bet she’ll have. She’s such a little girlie girl, I think she’ll have fun with the costumes and gear for dancing………..and it looks like she’s going to have a great time! 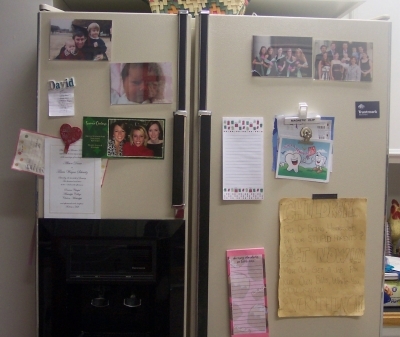 We got a new fridge about a month or two ago; my old one was almost 20 years old, yikes! The ice dispenser finally quit working and that helped speed the buying process along. Gotta have ice, right! This one is a little fancy schmancy with some fun features that I’m enjoying. The old one….yep, it needed updating. Oops, couldn’t find a picture without all the junk on the front……they hauled this one off when I got the new one installed. It’s a bit hard to take a picture of a black appliance I found out! Hubby and daughter didn’t want me to put anything back on the front but I’ve cheated some lately with a few pictures. We got a rebate deal with the fridge, in the form of a gift card that can be used anywhere. That just came in over the weekend and Don gave it to me! I’ll have to go shop for something else now! 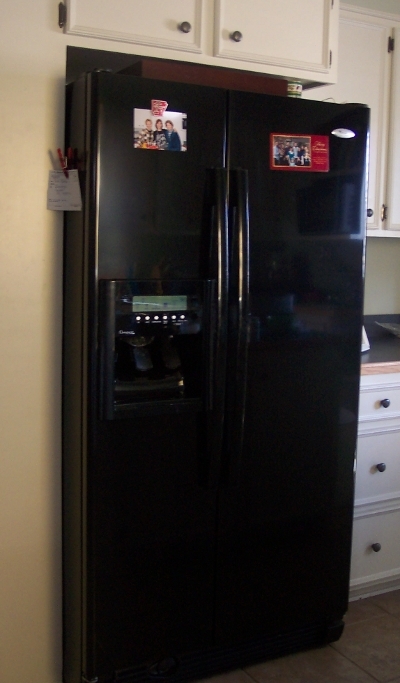 The new fridge looks so much better in my kitchen and it matches the other appliances……..it’s a good thing we got it when hubby was still drinking cokes, we used way more ice then than we do now! 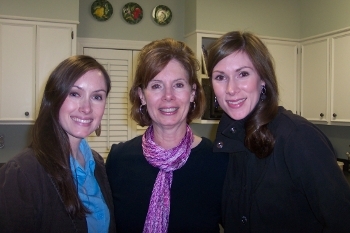 My blog is BACK, and so is my sis’s! Our blogs are kept on their website/server at home and the computer broke down a few weeks ago. Before that, my laptop died right around Christmas so I’ve not been around much lately. My brother in law has worked on their computers til he’s sick of it I’m sure….those kinds of problems are never fun. I got my laptop back a few weeks ago and it was still a black screen just like when I sent it for repairs! That was mildly annoying. They had to send us a new hard drive to install ourselves after they messed up and installed a keyboard instead. So for now my laptop is working and I’m trying to get everything put back on it and get my pictures burned/saved so I don’t get in trouble again! We’ve just been busy with everyday things…..work, watched some movies, had 2 of the grandkids over, had some get togethers with friends, reading, playing and various other appointments. Hubby has his cast off now and is starting therapy but has been told it could be 9 months or so before his bones are back to what they were before. I’m glad to be back up and running again, thanks to Tim! I hope to get my google reader whittled down over the next couple of days and will visit as soon as I can! A random list and NO, there won’t be that many things but I can’t get that silly song out of my head! 1. After all the birthdays we had in our family last month, we’ve had two more this week! My oldest son’s birthday was 2 days ago; they live in Houston and we talked to them on the phone for a while. Haven’t seen them since Thanksgiving and I miss them, especially now that my webcam is gone with the laptop. 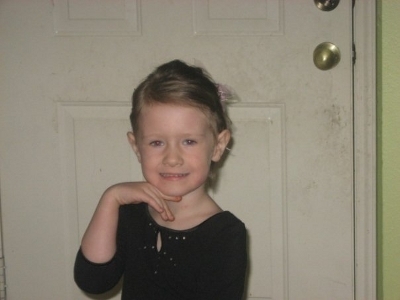 And Katelyn turned three! I think I’m going to a little party for her this weekend so that should be entertaining. 2. I decided to participate in something over at the living proof ministries blog (Beth Moore) for this year….scripture memorization, 2 verses a month on the first and fifteenth. I was a little late jumping in after the first but it’s still not too late if you’d like to join in. You can go to the main page and there will be a link to the original post with some explanation. You’ll be able to find the post from this week and sign up with a verse you want to memorize. I believe this is the post it links to. Let me know if you’re joining in. 3. I have become waaaay too addicted to another game online, spider solitaire! I used to see Liz playing it at home but that was when I had my laptop with other games with other stuff to do. Without my laptop and an old computer that’s hard to deal with I’ve now discovered spider solitaire and I can’t quit playing, must do something else! 4. 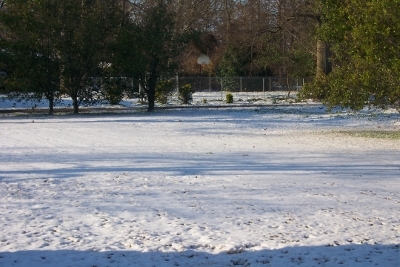 As cold as it is here, I can’t imagine how bad it must be everywhere else…..we aren’t used to the teens in the deep south! I hope you have a great Friday and fun weekend! Went to take my son last week for his laser eye surgery…..they let hubby go in to watch it all happen and he found to be interesting. Ewww, is all I can say to that, I couldn’t have done it! They said everything went ok. He slept most of Friday; drove himself back for a checkup on Saturday morning. He had 20/25 vision that day, a big improvement over no glasses but not as good as he was seeing with his glasses. But from what we understand the vision improves over time as the eyes heal from the surgery. A flap is cut into the cornea so I would think that does take time to get better (and just writing that makes me twitchy!) So we think he’s doing pretty good and are hopeful that in a month or two his vision will be even better!